Rusty Crawford, MPA, has joined the MU College of Veterinary Medicine in the newly created position of executive administrative dean. As the CVM executive administrative dean, Crawford will assist CVM Dean Carolyn J. Henry, DVM, MS, DACVIM, by overseeing human resources, budget planning and development, technology, facilities, space planning and utilization, and cultivation and management of income-generating activities. He will also lead the college’s efforts in preparing for the American Veterinary Medical Association (AVMA) accreditation site visit in 2020. Crawford’s ties to Mizzou date back to 1988 when he came to Columbia as an undergraduate and earned a bachelor’s degree in biology and chemistry. He went on to earn a master of public administration with an emphasis in finance and human resource administration at MU. 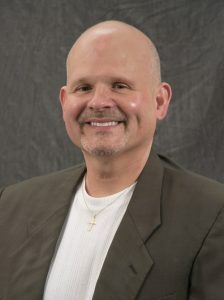 He began his career at MU in 1991 in the Psychology Department. He also worked for MU Direct and the School of Medicine before joining the UM System Information Technology Division in 2004 as the senior business manager of finance and administration. He identified the college’s recent purchase of the Veterinary Health Center at Kansas City Animal Emergency Center as a source for new revenue. The Veterinary Health Center at Wentzville, which the college opened in 2011, also has the potential to become more profitable, Crawford said. Another avenue to increase revenue generation that is worth exploring would be developing a veterinary technician certification program possibly through a partnership with an area community college. A technician certification program offers an additional benefit of helping to fill a staffing shortage at the Veterinary Health Center. “It’s a win for us, and it’s a win for prospective technicians who can pursue their education while still being employed,” he said. In addition to becoming well-versed in the college’s operations and facilities, Crawford said his top priorities for his first six months on the job include submission of the business plan for the proposed new Veterinary Medical Diagnostic Laboratory (that would replace and add to the existing footprint) and drafting an annual report due to the AVMA Council on Education (COE). The AVMA COE is the organization that determines accreditation for veterinary schools and colleges. Accreditation is awarded for a period of seven years. The MU CVM is due to go through the accreditation review again in 2020. Crawford began his duties Aug. 27, and while it is somewhat daunting, he said he is encouraged about this new position and especially the people he has met. Crawford resides in Columbia and has three children. When he’s not working, his hobbies include listening to music of almost all genres and watching movies. Of particular note is his passion for the Motown sound and more importantly his love of who he calls “the DIVA of divas,” Diana Ross. He admitted he is quite the fan having seen her countless times in concert as well as personally meeting her. He and his 15-year old son, Ian, have a trip to Las Vegas planned in November to see Ross at the Wynn ― front row center tickets, of course! He also admires actress Sandra Bullock and recently watched the movie “Miss Congeniality,” which is among his favorites.